There's no doubt that fruit smoothies are profitable menu items. 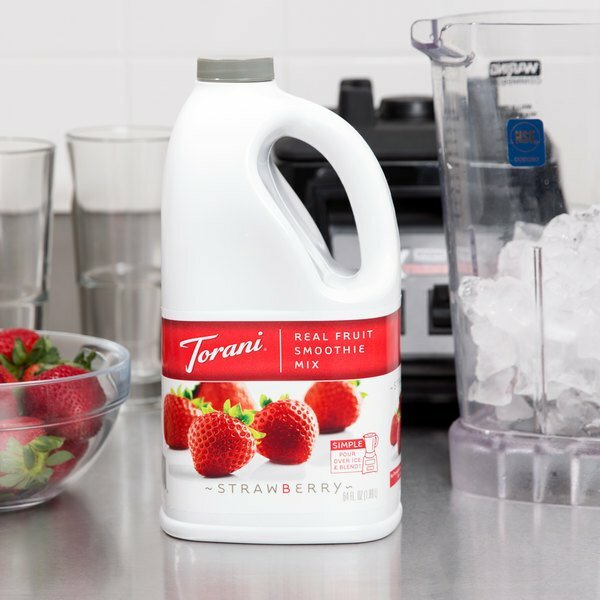 Make sure to enhance your bar, coffee shop, or cafe's drink menu with a variety of flavorful smoothies, including a top-selling strawberry-flavored smoothie made from this Torani 64 oz. mix! This mix delivers a refreshing, full-bodied strawberry flavor and vivid red color, while its large capacity means you'll be able to satisfy dozens of customers before needing a replacement. The 64 oz. container also features a large handle that makes pouring easy and a resealable cap that's great for keeping unused product fresh. Save time and costs from buying smoothie ingredients and lessen kitchen preparation time with this premade mix that's made with real fruit, no artificial colors, and no artificial flavors. Simply pour over ice and blend - it's that easy! Founded in 1925, Torani started as a family company in southern San Francisco and has since grown to an international brand of quality syrups exporting to 40 countries around the world. Their sense of tradition and experimental ambition has expanded their product line to dozens of varied flavors that can be tailored to almost every palate and recipe. For the best quality, we recommend refrigerating and using within two weeks after opening. Fill cup with ice and fill 3/4 full with Torani Real Fruit Smoothie Mix. Add chilled brewed tea to top line of cup. Pour contents into blender pitcher, and blend until smooth. Combine ice and Torani in a blender pitcher and blend until smooth. Combine ingredients in a cocktail shaker filled with ice. Pour into a glass and garnish with a lemon wedge. Fill cup with ice and fill half full with Torani Real Fruit Smoothie Mix. Add yogurt to top line of cup. Pour contents into blender pitcher, and blend until smooth. Combine all ingredients in a blender pitcher, and blend until smooth. Garnish with a lime wheel. This is my favorite smoothie mix. It's very large and lasts me for over a month. It's great with smoothies and lemonades. Very delicious and tastes like real strawberries. I've added the strawberry flavor to my list because of the positive reviews of others. It arrived quickly and I can't wait to try it out. This is our go to smoothie mix. It's so easy to use. Baristas can learn the recipe quickly and it is a quick and efficient drink. Our customers also prefer this mix over all other mixes. Torani makes really good fruit smoothie mixes. If you are going to do fruit smoothies strawberry is a must have it is one of the most popular flavors. This smoothie mix is very yummy for our strawberry ice cream smoothies we make at home. A good value too compared to grocery store prices. This product is a disappointment. I tried this product because of rave reviews on webstrauntstore but this product us sub-par. They claim to just add this smoothie mix with ice and you get a smoothie. I tried, but the taste is missing something. So I added twice as much mix as instructed to see if gets better but it still doesn't taste like much. I tossed it out. this tastes AWESOME in a blended drink or over yogurt. it has a really smooth consistency and it is not too sweet. the bottle lasts forever. As a coffee business in Alabama, we needed something cold to sell in the summer. Instead of traditional frappe drinks, we went with frozen lemonade. We couldn't keep enough strawberry in stock! The strawberry smoothie mix is excellent and makes a great base for our strawberry daiquiris. The mix is thick and luscious. Bursting with fresh strawberry flavor. I am in love with it. Who doesn't love the taste of fresh strawberries. Torani smoothie mixes have the fresh taste without the watered down flavor I have had at other places. 1 of the most popular flavors. Besides Mango, Strawberry is the next best seller! We use this mix to make our strawberry smoothies and it’s easy to add banana to make a strawberry banana smoothie instead of having to stock the strawberry banana smoothie mix. A lovely strawberry fruit smoothie mix that is perfect for making daiquiris or smoothies. Really pretty color and very tasty. Love the fresh strawberry flavor. Absolutely love these bases- we don’t use them as a complete smoothie mix, but instead use them as the liquid base in our real fruit smoothies. So delish! 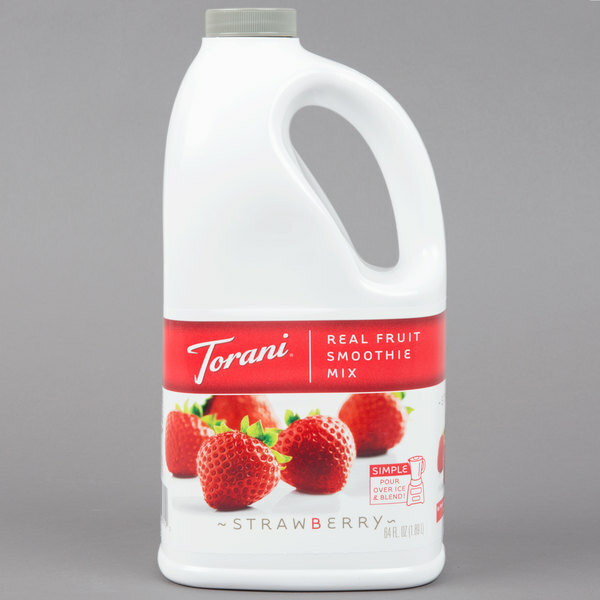 The Torani strawberry fruit smoothie mix is very delicious. The mix has a great bright red color and the mix can also me used to flavor lemonade. We love it. I love using the Torani strawberry smoothie mix to flavor our ice cream. The mix is very fresh tasting and adds a great strawberry taste and appearance to our ice cream base. The strawberry smoothie mix is a customer favorite during the summer months, the smoothie mix allows you to quickly and easily make the drinks in pretty much any blender.